Gyeon Q² Mohs + and Gyeon Q² DuraFlex are state of the art ceramic coating systems that simultaneously protects and enhances the appearance of automotive paint. 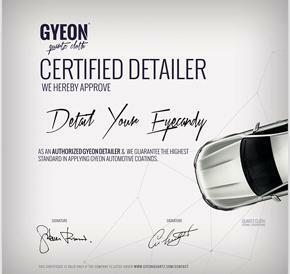 DETAIL YOUR EYECANDY IS EAST ANGLIA'S GYEON CERTIFIED DETAILER. Gyeon Q² Mohs+ and Gyeon Q² DuraFlex are state of the art ultra hydrophobic quartz coating systems that simultaneously protect and enhance the appearance of automotive paint. All of these coatings are designed for professional use only and applied by certified Gyeon detailers such as ourselves. Each one is applied with a 5 year warranty offering the highest level of protection throughout that period. 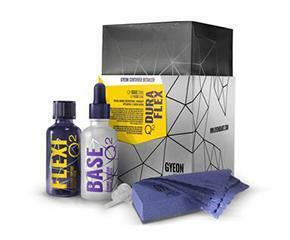 Completely reformulated for 2018, the Gyeon Q² Mohs+ package consists of a two-stage formula; a base coat application of Gyeon Q² Base and a top coat application of Gyeon Q² Phobic. This dual-stage coating, available only through Gyeon certified detailers, provides some of the longest lasting, visually stunning, and finest performing results on the market today. The Gyeon Q² Mohs+ package begins with a thick layer application of the all new silazane based Gyeon Q² Base which provides extreme swirl resistance and self-cleaning properties. This pure silazane base coat is the hardest professionally installed coating ever developed. Whilst this base coat provides unparalleled protection to the vehicles finish, Gyeon Q² Phobic top coat helps to extend the life of the overall coating whilst at the same time providing protection from watermarks, staining, bird droppings, bug splatter, road salt and harmful UV radiation. How durable is the Gyeon Q²Mohs+ package? So durable that it is complemented with a Gyeon 5 year conditional warranty! A brand new offering from Gyeon Certified Detailers for 2018, Gyeon Q² DuraFlex. 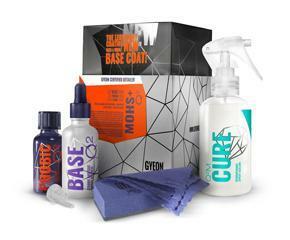 This package is an advanced, two-ingredient and double layer ceramic coating, designed to suit the requirements of Gyeon Certified Detailers. The pure silazane Q² Base coating is the hardest automotive coating ever developed. It is a technological breakthrough and requires only one layer. Q² Flexi is a thick and extremely slick topcoat that has set new standards in gloss, hydrophobicity and durable self-cleaning. Boasting incredible chemical and swirl-resistant properties, Gyeon Q² DuraFlex also provides excellent levels of protection against bird droppings, bug splatter, road salt and harmful UV radiation for upwards of two years at a time, even on cars used as daily drivers. Furthermore, it also causes treated surfaces to become both water hating (hydrophobic) and oil-repellent (lipophobic), which gives rise to a strong self-cleaning effect. This means that your car will stay cleaner for longer in between washes, and will acquire fewer bonded contaminants (e.g. tar spots) over time.